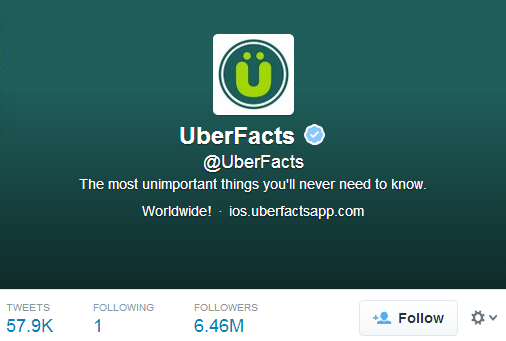 One of the saddest pieces of trivia in the world is the number of people who follow Uberfacts on twitter. Apparently this 'verified' account has 6.46M followers. I was hoping that 6.46M meant 6.46 Morons but sadly, it means 6.46 *MILLION* Morons. Uberfacts crime? It presents extraordinary 'facts' without providing references of any kind. Extraordinary claims require extraordinary evidence was a phrase made popular by Carl Sagan. It is the heart of the scientific method, and a model for critical thinking, rational thought and skepticism everywhere. Since Uberfacts provides no references for any of their 'facts' it takes the reader a non-trivial amount of work to determine if they are true or not. Many of them are too ill-defined to be either true or untrue on their own. And many of the others, if you do happen to spend the time it takes to research them, are somewhere between partly or wholly incorrect. I love trivia and triviality. The twitter account QIkipedia (related to the BBC Televsion show QI) is a much better example of a trivia sharing service hosted on twitter. * I would prefer it if the QI team were even more forthcoming with references. But at least due to point 2 and 3 there are avenues for corrections if any of the followers do find errors. ** When, for example, they promote Molly Oldfield's book, they're clear that she works for them. Etc. And note that none of this is directly related to whether the facts are right or wrong. If all of the damn 'facts' were right, I probably wouldn't care if they messed up all the other points. Are you kidding me? Is this true? 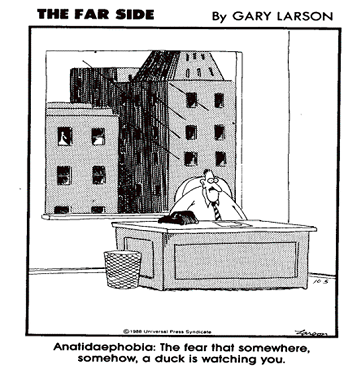 Is there really such a fear? It doesn't sound particularly true, though there is a certain ring of familiarity that I can't quite put my finger on. Let's see if it's mentioned at Wikipedia. 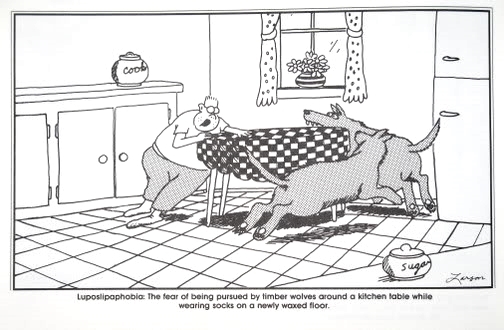 So it's a joke from Gary Larson, no more factual than 'luposlipaphobia' (the fear of being pursued by timber wolves around a kitchen table while wearing socks on a newly waxed floor). But why am I being such a grouch about this? What's the harm? Shouldn't we just be entertained by these facts? Chill out and let it go? As they say in the subtitle 'Bringing you the most unimportant things you'll never need to know', these things are chosen for their innocuosness. So what if they're right or wrong? But these 'uberfacts' don't belong to the category of thoughts that bring entertainment for their own sake. They are almost entirely "facts" which are only entertaining if they are actually true. If they're not true, they are pointless at best, time-wasters at least, and potentially harmful. Here's the scary bit: these uberfacts take on a life of their own, and Darwinism isn't quick enough to take care of the people who spread them. 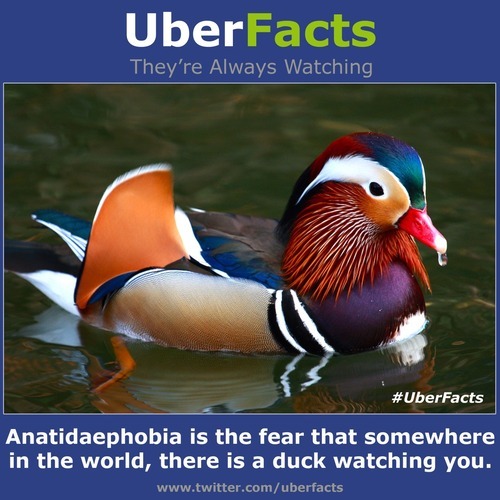 For example there are serious articles discussing the likely causes of anatidaephobia, and helpful guides for those who suffer from this worrisome-- and growing-- malady, at sites such as voices.yahoo.com, "serious facts", and "factual facts". Don't trust that sites like Snopes will do all the work of sorting out the lies from the truth. You can't leave it up to Snopes. It's everyone's responsibility: mine, yours, everyone's, to stop repeating (retweeting, posting, regurgitating) the endless stream of lies and bullshits.